This oil is particularly aromatic, and is perfect for adding fragrance when cooking. 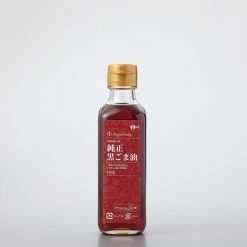 To make our pure black sesame oil, we took black cooking sesame, which is not usually used for making sesame oil, and thoroughly roasted it; then pressed it using traditional manufacturing methods (traditional pressing methods). Only the first pressing is used in this oil. If the roasting temperature is lowered, the black sesame will turn an amber color; while roasting it at higher heat produces the unique deep color of black sesame oil. Seasonings such as oils can be a crucial part of a meal, turning plain food into a delicious experience. After all, sometimes we only think we don’t like certain foods because we haven’t tried them with the right seasoning! Sugarlady’s pure black sesame oil and other seasoning products are safe and free of chemical seasonings and additives, letting the true, natural flavors of the ingredients themselves shine – and allowing you to enjoy your meal without worry. 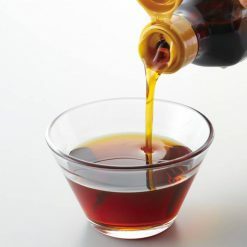 The strong flavors of sesame oil and the bitterness it acquires from its thorough roasting can really stand out in a dish, and so it is especially recommended for use in intensely flavored Chinese- or Korean-style dishes. It can also be used to give fragrance to stir-fry, and is perfect for adding to dishes as a finishing touch, or using to flavor sauces. Because the sesame has been thoroughly roasted, it develops a strong bitterness; meaning one needs only to sprinkle a small amount of it onto a dish to have an impact on that dish’s seasoning. It pairs well with other strong ingredients such as vinegar or garlic. This product contains sesame cooking oil (China, Myanmar, other countries)..